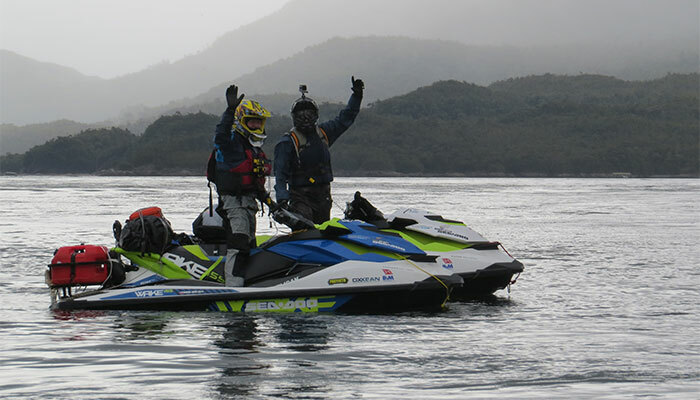 More than a year after the departure of the first jet ski expedition traversing the southern waters from Puerto Montt to Laguna San Rafael at the beginning of high season, Oxxean Marina commemorated this historic expedition, in which its participants became pioneers on an unprecedented adventure in our region. A route of 1500 kilometers aboard a vehicle traditionally used for aquatic sports and the experience of the team members making this voyage combined for a magical 10-day trip that showed the world Patagonia from the sea. Saturday, March 19th, 2016, a sunny day. Expectation can be felt in the air at Oxxean Marina. At midday the “Deep in Patagonia” expedition’s jet skis are fired up for their journey to Laguna San Rafael. The atmosphere is cheerful for all those in attendance. Months of preparation went into planning the trip connecting the Lakes Region with Aysén, observing from the sea the hypnotic beauty that makes Patagonia a unique and attractive destination. 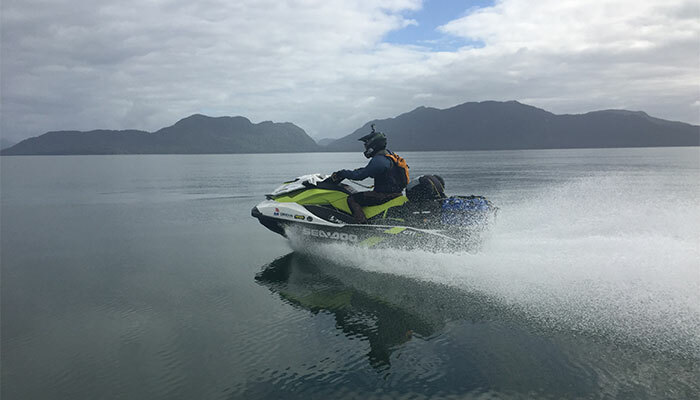 It is the first jet ski expedition to be carried out in Patagonian territory. The itinerary includes Chaitén, Palena, Puyuhuapi Hot Springs, Puerto Aguirre, San Rafael Glacier, and Puerto Chacabuco. OXXEAN and Captains of Patagonia support the voyage because its spirit aims to promote the territory, and what better way than through this experience that is also being documented to share with the world, possible to view in real time at the website www.expenews.com. Ricardo, why the name “Deep in Patagonia” for this expedition? The project idea came about in a conversation with Santiago Fernández, around the grill with a beer. It was born from the desire that Santiago has had for many years, to complete an expedition to Laguna San Rafael by sea. And we call it “Deep in Patagonia” because the final destination is Laguna San Rafael, which, even though it is not the southernmost point of Patagonia, it is probably one of the most beautiful areas in Chilean Patagonia, along with Torres del Paine. It’s about reaching the deepest parts of Patagonia, by way of canals and fjords. Why leave from Puerto Montt? We chose Puerto Montt for the challenge of covering such a long distance and because it’s easier for the public to dimension the distance. It’s like the famous Paris Dakar. 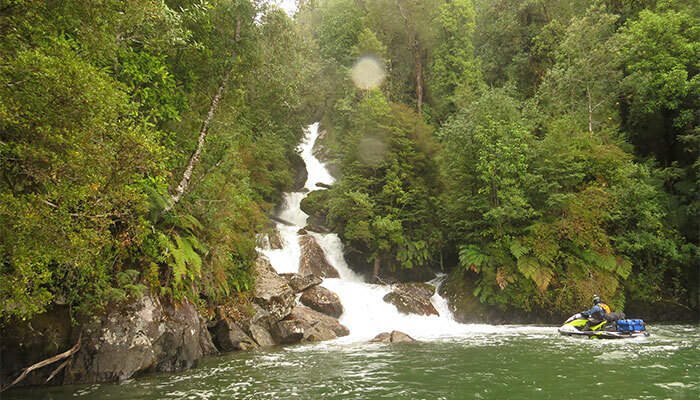 Puerto Montt and Laguna San Rafael are widely known. Another important point for leaving from Puerto Montt was the fact that the maritime company B&M, which has a relationship with the Captains of Patagonia project, put us in contact with their friends at OXXEAN for logistical support during the expedition. And how has the relationship with OXXEAN been in the framework of this expedition? 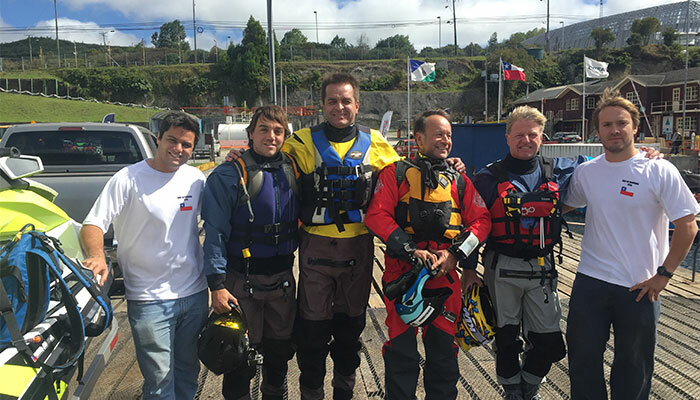 The availability of OXXEAN has been one hundred, or one hundred ten percent, in terms of support, in terms of leaving the jet skis, of bringing them, offering us help in both Puerto Montt and Puerto Chacabuco. They are very clear that OXXEAN is very well positioned and they are not interested in developing or highlighting their brand, rather in encouraging and promoting Captains of Patagonia, to promote this destination. The trip is 10 days, total. How did you structure the route? We chose this route basically by taking into account the autonomy of the jet skis and the places we could get supplies more reliably by land, absolutely independent of sea conditions. The other thing is visiting all the locations like Chaitén, Puyuhuapi, Quintupeo Fjord, Tic Toc Bay, Corcovado Gulf. Names one has heard. This is the opportunity. They are jet skis for two and three people that have a total load capacity of approximately 200 kilos each. These jet skis, really, are almost boats. They are comfortable and smooth. We chose this model because it has a V-shaped hull, so it cuts through waves very well. And we made some small adaptations to them. We incorporated 12V connections to charge GPS and phones, a rack on the back to carry the extra fuel; dry bags with all the equipment; changes of clothes, food, tents, and sleeping bags; all in dry bags tied to the back of the jet ski. What are your expectations for this trip and why do you call it an “expedition”? We call it an expedition because what we’re about to do is quite rough. It’s eight days of riding in the cold and on inhospitable seas. Even though we’re not going through open ocean, we will be in canals with a lot of wind and considerable waves, and in addition to being shorter, they make navigation difficult. The climate in Patagonia is very unpredictable. And on jet skis, you get wet. That is, you get splashed, you get water in your face. There is no windshield in front of you. It’s you against nature. The sections are long. It’s six or seven hours riding daily. So, when we proposed the idea as a trip, everyone said: no, this is an expedition; a challenge. Would you recommend to people who like adventure tourism, who love outdoor activities, who have a special attraction to all the water that characterizes this environment, that they come here to visit Patagonia, to navigate and travel? What would you tell them from here? That I think this is one of the prettiest places in the world. It must be in the “top 5” wild places to discover and explore. You hear of places like Alaska, but these are places that are much more populated and globalized. I think Patagonia continues to be a formidable place, difficult to access, where one is dependent on climactic conditions, that’s part of its beauty. I totally recommend it.